Editors: Alldred,Pam, Cullen, Fin and Edwards, Kathy et.al. 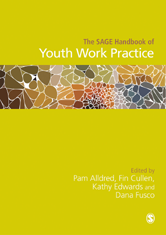 The SAGE Handbook of Youth Work Practice showcases the value of professional work with young people as it is practiced in diverse forms in locations around the world. The editors have brought together an international team of contributors who reflect the wide range of approaches that identify as youth work, and the even wider range of approaches that identify variously as community work or community development work with young people, youth programmes, and work with young people within care, development and (informal) education frameworks.